Buying dividend stocks out right or timing the entry? There are two camps among the dividend growth investors. One camp represent an idea that over the long run, it doesn’t matter whether you buy the stocks out right. As long as you keep buying regularly and for the next 20 years, the difference is negligible. The second camp advocates calculating the fair value and time the entry to get a better price of entry. For many years I belonged to the first camp. I used to buy a small amount of shares (as long as it was commission feasible) and did it regularly. It was mostly because I didn’t know how to obtain the proper data and information to calculate the fair value, to determine whether a stock is undervalued or over-valued. What seemed undervalued to me was undervalued to others. So I gave up looking for a better entry points. It all looked to me as a game of dreamland-style data. While searching for a method how to evaluate stock I got many confusing numbers, results, and conflicting methods. It made absolutely no sense to me and I couldn’t see any consistency in the effort of searching for a fair value. As time went by, I realized that you need to find a method you feel comfortable with, create the rules based on that one method and then rigorously ignore everything else. To illustrate the point, I followed a few methods – fair value calculated by Dividends4life, author and owner of dividend growth stocks blog who makes great analysis of several dividend growth stocks. 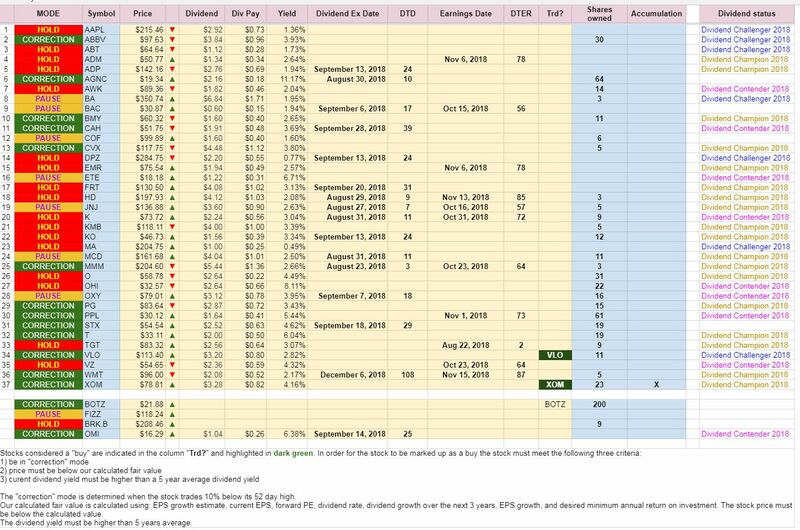 If you are new to dividend growth stocks investing I strongly recommend you following D4L’s blog and read his analysis. The second method was Graham formula and then my own method. For example, Automatic Data Processing Inc (ADP) Graham number is $50.33, D4L’s calculated fair value is $108.86, and my own calculated fair value is $124.24. Well, pick a method and stick to it with meticulous consistency. It will make you no good jumping from one calculation to another. Pick one method and stick to it. Over time, I created my own screener added my formulas and now stick to it. What is in it? I use three criteria to determine whether a stock is a “buy” or not. The screener uses the following inputs: Next 5 year EPS growth estimate consensus, forward P/E, current EPS, dividend rate, dividend growth over the next 5 years, desired minimum annual return on investment, and payout ratio. Using these inputs I calculate my fair value. The second criteria is that the stock must retreat and trade 10% or more below its 52 week high. And the third criteria is that the stocks current dividend yield must be higher than the 5 year average dividend rate. We know that if the stock price goes down, the dividend yield goes up. If it exceeds 5 year average, the stock can be considered undervalued. If all three criteria are met at the same time, the stock becomes a “buy”. In the watch list / screener such stock is displayed in a column “Trd?” and is highlighted in green. The watch list now updates automatically. Inputs for calculations are automatically imported from web sites such as Finviz, Yahoo Finance, Google, and other financial portals, loaded into formulas and results are displayed. Now all you need to do is to wait when a stock appears as “undervalued” or a “buy” in the column “Trd?” and buy. This watch list can make your investing easier too. You can follow the watch list and keep investing on your own. 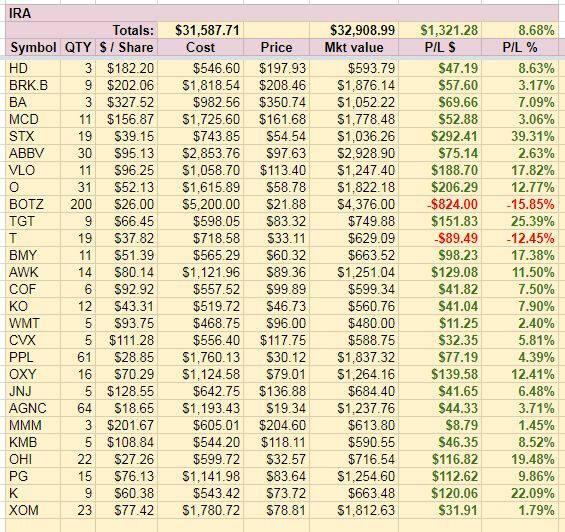 If you want, you can send us a request for a stock addition and we will add your dividend growth stock into our watch list and you can keep following your stock in the screener. We invest our options proceeds. We trade options, collect premiums, and invest 50% of the premiums into the dividend growth stocks from the watch list above. This is a fulfillment of my dream – create a stream of income which can be invested into stocks. This is what I striven to create since 2006 when I started investing into dividend growth stocks. Those Graham numbers are beyond meaningless. That may have been relevant in 1973, but it has absolutely no relevance here in 2018. Ciao Mart, is the screener in google Sheets format? Yes, it is Google based. Please, when you open it, save it as your own copy and edit your own copy instead of this one so it stays in the original state for others. Thanks a lot Mart! I’ll check it out when I am back from Japan!